You know you’re curious what I’ve been cooking since I started work. Nothing too extravagant or time consuming, but some new tasty recipes from some new cookbooks on my shelves. 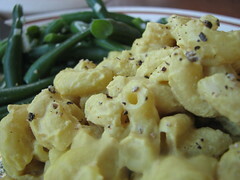 Let’s start with the shining star: VeganDad’s mac and cheese. There are so many versions of vegan mac & cheese, most of them okay. I adore VWAV‘s alfreda sauce, but it’s not like Kraft. I’ve been seeing a lot of other people make vegandad’s recipe, so I just had to do it, once I aquired all of the ingredients. It was relatively easy to make, cook noodles, blend sauce, mix, simmer, done. This recipe was creamy and satisfying. The recipe makes a HUGE batch but it went quickly and is awesome as leftovers. I could easily see this becoming a baked dish with breadcrumbs on top. I haven’t priced it out, but there’s a lot of nuts like pine nuts that are pretty costly. Seriously, though, I don’t care. With this recipe you’re getting a motherload of protein and B12 and not supporting big business or factory farming or any of that malarky. I can’t wait to make it again. 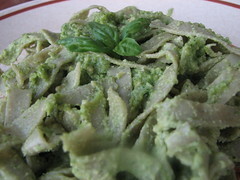 Next up, ED&BV’s Lemony Cashew Pesto. I normally just make pesto by instinct and taste, but after seeing a friend’s photo of it, I had to try it. I think this recipe may be the reason I bought the cookbook. I haven’t been disappointed with it yet. The Spicoli burgers are awesome, I’ll have to make them again since I took no pictures. We were busy woofing it down. This pesto isn’t anything out of the ordinary except that she uses cashews (and a lot) instead of the classic pine nuts or walnuts. The cashews transformed the dish into more of a cream sauce than a basil/oil party. It was a nice surprise and it was enjoyed thoroughly. I had to add 1/2 cup more water than the recipe called for to make it the consistency I wanted. I think because my cashews were in the fridge, they needed more hydration. I also didn’t follow the recipe exactly in the method (a bad habit I just started. I get so excited to cook I jump steps). I just added the basil too early but I don’t think it affected the end product. I used lime juice instead of lemon juice. I didn’t have powdered mustard so I used 2 tsp of Dijon instead. 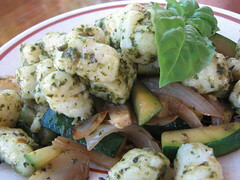 Since it’s summer and my basil is flourishing, I made the pesto from VWAV as well as the gnocchi recipe. I’ve made these recipes before and this time it was perfect. I think I baked the potato out just right, kneaded the dough. I just sort of used my feel for how much flour I needed, since it’s been hot and a little humid, the dough needed more flour. I timed the cooking of the gnocchi just right instead of spacing out and forgetting if the dumplings were in the water 2 minutes or 5. They were plump tasty little guys that absorbed the pesto just right. Oh, and I rocked on forming the gnocchi, fork marks and all. It was a good day. VWAV continues to be my favorite vegan cookbook. I haven’t had a bad or strange recipe yet. This recipe has been a challenge for me. 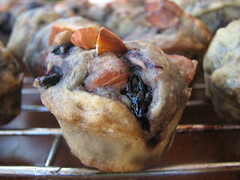 Also from VWAV, the Cherry Almond Muffins are very promising, but I altered the recipe to use flax instead of soy yogurt. Maybe I used too much flax seed or these muffins can’t handle the flax. They were just a little too dense. I’ve made it before as a tea bread and all the cherries sunk to the bottom (I should have tossed them with flour). 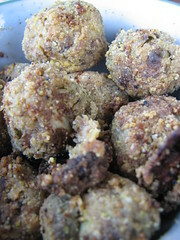 This batch was mini muffins and I was using fresh pie cherries from a local cherry tree. The cherries were just too small to go in my pitter which resulted in much cursing and cherry juice stains but luckily, no chipped teeth. I’m not interested in seeking out pie cherries anymore. They still looked cute and tie-dyed from all the extra juice, but the texture was just off. I’ll have to give them another try with yogurt or less flax. For a 1x batch I used 3 Tbl whole flax seeds, ground and 9 Tbl water. It seems like a lot, but that was my conversion for the 6 oz of yogurt. Oh, well, there’s plenty other yummy food to love out there. 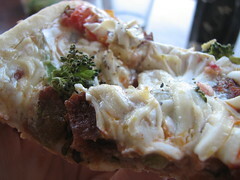 Another recipe I made recently from ED&BV was the hempanola. Those Canadians and their hemp, what show offs. Luckily we can buy hemp seeds in this country and they are really good for you with all that omega business. Did you know that in China you can buy roasted hemp seeds at the movies like we do popcorn? I was intrigued by her granola recipe, after just making Hannah’s granola. This one was much less sugar, using the very underappreciated rice syrup. I didn’t have enough hempseeds for the recipe and subbed in a little of my puffed amaranth and it all worked out just fine. The granola is good, not too sweet and it browns up nicely. No complaints here. I think I’ll stick to my own granola recipe until I find another one that intrigues me. I will incorporate adding hemp seeds to it and using some rice syrup instead of all that expensive agave. I found it interesting she used barley flakes, which were pretty easy to find in the bulk section and look just like oats (and taste the same). 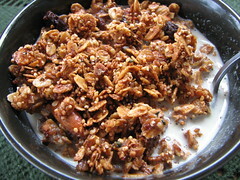 I added a little cardamom to the granola, which was a fun twist, as well as my obligatory add of buckwheat crispies from Ani’s Raw Kitchen. Another new cookbook I have in my collection is Veganomicon. I was very jealous that it was published shortly after heading to Peru and heard about the recipes for months. It was torture. But now I’m back in the US and have my own copy and am slowly working my way through this new vegan bible. I made the Cornmeal Masala Brussel Sprouts recently and that was a fun change from my usual steamed sprouts with garlic. The coating is really flavorful and it’s fun to have a tender little brussel sprout inside. It’s easy, relatively fast, and fun to eat. Living so close to Food Fight is awesome. We can get Teese whenever we please and since I make a really good pizza dough at work, pizza’s been on the menu pretty often. My husband loves the Teese, which says a lot because he doesn’t like most of the vegan cheeses out there. The most recent pizza I made was dubbed the best vegan pizza ever. On a thin crust pizza I put some homemade crockpot tomato sauce, roasted garlic, roasted peppers, broccoli and Teese. Simple but delicious. Later on in the week we had a fancier one with kalamata olives, tofu, artichokes and the rest of the roasted garlic. Speaking of Teese, sorry to tease you with this one. I found these crazy cauliflowers at the farmer’s market and transformed it into the red lentil cauli curry from V’con but didn’t get any pictures of the end result. 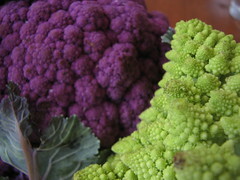 So imagine it with purple and green cauli. The recipe itself came out great. It’s not a quick recipe but it makes a big batch so I didn’t have to cook the next night. It would be good over rice but i just dipped some French bread into it and sopped it up. Before this post takes up more than a page I’ll end with an older photo, from strawberry season. 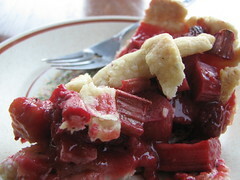 My rustic strawberry rhubarb pie, which I always intend to make more and freeze and never do because I eat it for breakfast, lunch and dinner until it’s gone. I already miss strawberry season, but I found out yesterday there’s an end of summer strawberry season for a different species. Yay! I love ED&BV! It has to my favorite book, and the pesto recipe is addictive. I can eat just the sauce with a spoon. We need to have a pizza party. We must, I mean! I’m really enjoying this cookbook too. Her recipes are simple and tasty, the best combo for not having all day to cook.